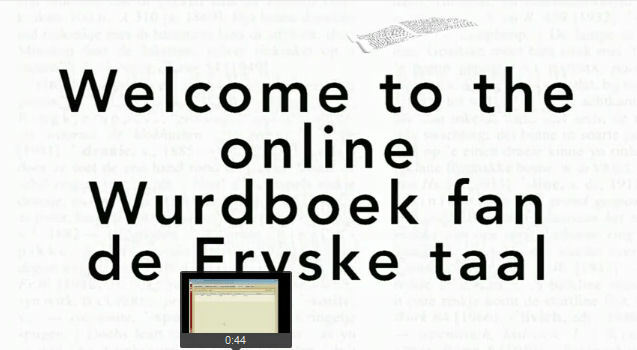 The Wurdboek fan de Fryske Taal (Dictionary of the Frisian Language)-project includes the vocabulary of Modern West Frisian from the period 1800-1975. The dictionary’s metalanguage is Dutch. A volume of 400 pages comes out every year, the first one in 1984. The editorial phase was finalized in 2009, the final editing and publication phase in 2010. The Frisian data is online available via the well-established GTB-web application, which also holds the four major scholarly dictionaries of historical Dutch: The Dictionary of Old Dutch (ONW), the Dictionary of early Middle Dutch (VMNW), the Dictionary of Middle Dutch (MNW), and the Dictionary of the Dutch language (WNT). The group of possible end users varies from general public to scholars in the Netherlands and abroad. It is for instance known that the editors of the OED frequently use the online dictionaries, especially for the dictionary’s etymology field. Wurdboek van de Fryske Taal online”, article at website ‘De Nederlandse Vereniging’, September 6, 2010. “Woordenboek der Friese taal online”, article at Kennislink, July 16, 2010. “Wetenschappelijk Woordenboek van de Friese taal”, article at ‘Blog van de Historische Vereniging Noordoost-Friesland’ by Hans Zijlstra, July 7, 2010. “40.000 kaartjes voor het woordje ‘de’ staan online”, article about WFT-GTB in Friesch Dagblad, July 6, 2010. “25-dielich Wurdboek fan de Fryske Taal online”, article at ‘Hallo Fryslân’, July 6, 2010. “Het laatste grote woordenboek op papier?”, article at NRC website by Ewoud Sanders, July 5, 2010.